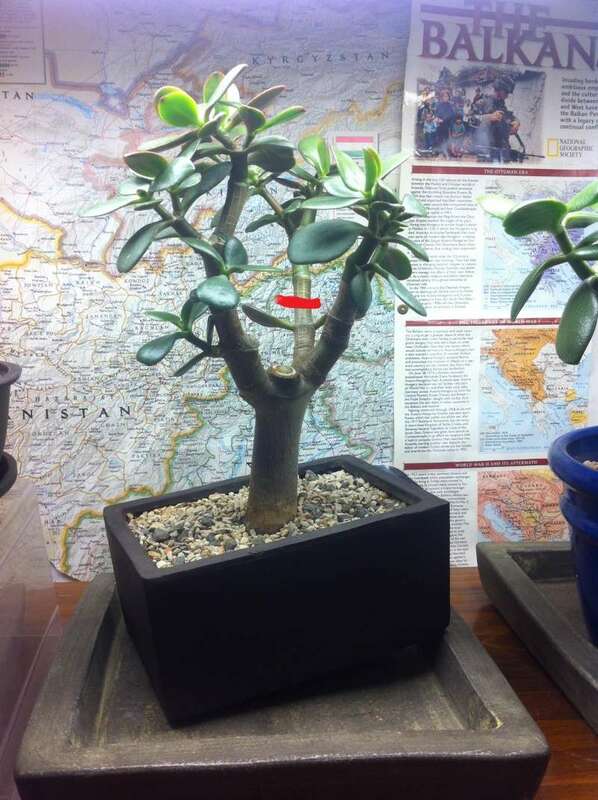 When you say that branch is coming off, do you mean a cut where the red line is, or the whole branch is coming off? I can't exactly tell from that view, but it appears to come off the trunk right where the main right branch originates. if so, I think I would remove the branch entirely to prevent reverse taper. As to sunburn, my crassula get placed to go into shade by early afternoon and I've never had that problem. However, that's probably a separate concern from pruning. There shouldn't be any problem with pruning now. Put it outside, it will grow quicker in full sun. You can put a little piece of shade cloth over it, during the hottest hours of the day and gradually make it use to the sun. It's a South African dessert tree and you are worrying about sunburn in Canada!!!! Wow. That said, always good to give a tree a gradual move into sun. As Andre says, it should be fine in full sun. Now I'm hungry for SA dessert! The 4th African Bonsai Convention is happening in Cape Town in October . . . . . . so, now you have an excuse! Haha only got sunburn the first day it went outside. No need for shade cloth, the clouds work just fine... That said I could certainly go for a bit of desert weather right about now.